I was sent a link by one of our vendors the other day that I thought was worth sharing with you. The website is about signage, branding and creating destinations, and I would encourage both owners and tenants to have a look at it. As commercial owners and managers we can encourage our tenants to follow some of these sign guidelines. We also can work toward finding good anchor tenants that draw people to our buildings. By recommending, and even requiring in the lease that tenants are open appropriate hours and days of the week, we can help the entire district or facility thrive. Site navigation on www.rogerbrooks.org is excellent. Please take a couple of minutes and look around. You will find it helpful and in some cases motivational. I call this the “7-8-7 Rule” because of the three most important statistics that make a downtown a successful and vibrant destination. 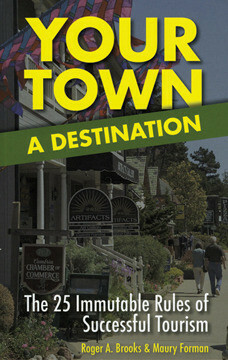 Think of your favorite destination downtown’s. Are they beautiful? Do they feel safe? Are there things to do after 6:00 pm? 70% of first-time sales at restaurants, retail shops, lodging facilities, and attractions can come from curb appeal. We all travel: Think about these phrases: “That looks like a nice place to eat.” Or, “That looks like a nice place to stay.” Virtually every person on the planet has said those words at least once, if not dozens of times. You can spend millions of dollars marketing a town or downtown, and none of that will make me – the visitor – walk through your shop’s door. You, the merchant, must do that. Beautification, or curb appeal, is an investment with a tremendous return. Women account for 80% of all consumer spending. Yes, it’s true. I use this statistic a lot in speaking engagements, and I always pause to hear the audience reaction, which ranges from “You go girl!” spoken by women, to “That’s all?” from the guys. Women will spend more money in places that look inviting, are clean, and feel safe. If you cater to women you will ultimately win the entire family’s business. Women also account for 70% of all travel decisions including places to stay and eat, and “must see” attractions. 70% of all consumer retail spending takes place after 6:00 pm. Are you open? This is one of the reasons downtown’s are dying – they’re not competing with malls’ later hours. In the 60s, stores typically closed at 6:00 pm, 5:00 on Saturdays, and were closed on Sundays. In the 70s malls were open until 8:00 or 9:00 pm, but still closed at 6:00 on Saturdays and were open from noon to 5:00 on Sundays. Fast forward to today, and you’ll find just about every successful mall opening at 10:00 and staying open until 9:00 (or later) seven days a week. Meanwhile, traditional downtowns are stuck in the 1960s, and most are dying. While we are moving to the European standard of dining and shopping later in the evenings, downtown’s haven’t made the change at all. In this video blog, Roger teaches the rule of perpendicular signs. 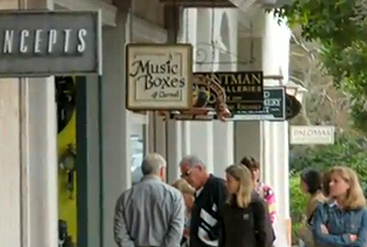 Many shops in a downtown district simply place their signs above the door or have them painted on windows. More often than not, these signs are missed by potential customers totally unaware of what they have to offer or that they even exist. You must have anchor tenants in your community or downtown if you want to be a destination. They make you worth a special trip and an extended stay. Everyone will benefit from them. Think Orlando and Disney World. Enjoy and apply!